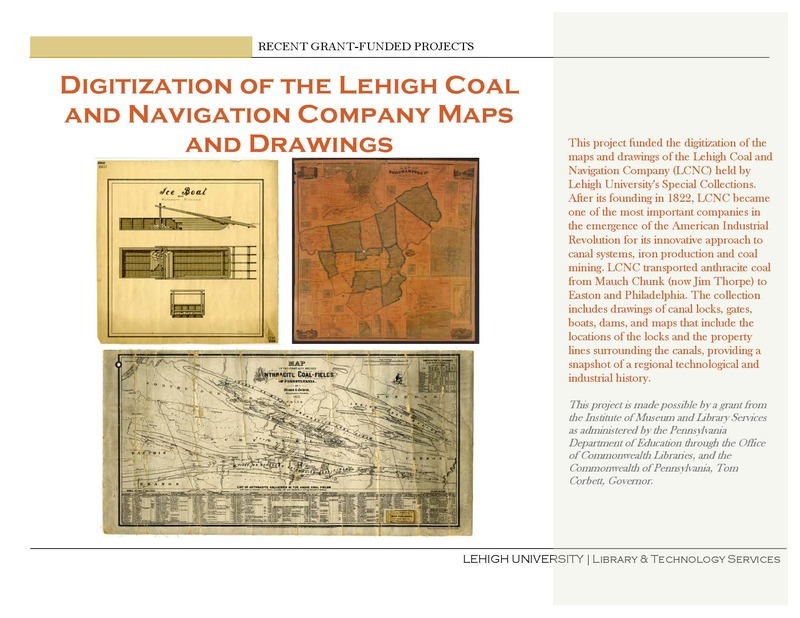 This project funded the digitization of the maps and drawings of the Lehigh Coal and Navigation Company (LCNC) held by Lehigh University's Special Collections. After its founding in 1822, LCNC became one of the most important companies in the emergence of the American Industrial Revolution for its innovative approach to canal systems, iron production and coal mining. LCNC transported anthracite coal from Mauch Chunk (now Jim Thorpe) to Easton and Philadelphia. The collection includes drawings of canal locks, gates, boats, dams, and maps that include the locations of the locks and the property lines surrounding the canals, providing a snapshot of a regional technological and industrial history. This project is made possible by a grant from the Institute of Museum and Library Services as administered by the Pennsylvania Department of Education through the Office of Commonwealth Libraries, and the Commonwealth of Pennsylvania, Tom Corbett, Governor.